An interview with Daniela translated from Italian to English appears at the link above. It's just the automatic Google translation, so it's a bit crude. Are there any native speakers who could do better? It's dated 12 January, so there's nothing all that new or significant in there (the injury is not even mentioned). In related news that actually led me to the article, today Daniela attended the Gilles Simon - Simone Bolelli match this afternoon. The good news is that she was off crutches, a sign of progress in her recovery. The connection between her and the 22-year old obscure Italian is that they both share the same trainer Marco Panichi. Well, that's the only connection we know for sure, speculation will certainly arise when she's seen in the box of another player roughly her age. Thanks to kallur83 at Tennis Forum for the heads up on the article. Thanks, seems the injury really is getting better if she is off the crutches. Artcle is in italian... I think from Italian Vanity Fair although I am not 100% sure...I dont know if there are any Italian speakers on here or people who understand italian but from what I gather, I think Daniela talks about italian guys, tennis and her family. hi Albi, i see you are italian. Could you please help translate the article or just give a brief summary of the interview if possible? Daniela has always done most of the physical preparation in Italy in the last years... Panichi isn't Daniela's personal trainer: he works in Rome with a group of tennis players (mostly Italians: Bolelli, Santangelo, Errani, Schiavone sometimes) and Daniela joins them. I'm working on it. Which one would you like to read first? "Servizi Vincenti" or "MenStyle"? Exclusive Interview with Daniela Hantuhcova: the tennis model: "Italy, my love"
"Without the help from my family, I wouldn't have recovered. 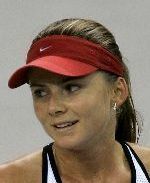 Homesickness is the thoughest opponent"
"Life is up-and-downs: I have left my "downs" behind (when she was ranked out of the top50), now everything works well"
The girl who's talking like this on the telephone is Daniela Hantuchova, the beautiful Slovakian girl who has achieved her goal to come back in the top10 (currently ranked n.9, after being n.5 behind the Williams sisters and the belgian duo Henin-Clijsters in 2002, her break-through year when she unexpectedly won Indian Wells def. Hingis) and qualify for the WTA Masters in Madrid, thanks to a superb season-ending run. The third person I want to thank is Daniela, nice an friendly as always and, after a few minutes, less shy than usual (and remember, phone interviews aren't the easiest). Not only she plays good tennis (an aesthetically perfect tennis reminiscent of her physical appearance), not only she's beautiful, but she has also a great brain in her head, and head that sometimes looks tiny and cute, compared to her infinite legs. A talent which is expressed even outside the court. She also plays the piano pretty well ("Beethoven, Bach... the usual classical things"), speaks four languages (and of course, spending her time between Rome and Montecarlo, she's learning Italian). "My tennis has come back to the levels I knew I could reach, I had to struggle, I got over physical and personal problems: I started winning when I was very young, I wasn't ready for all the pressure, every defeat left me down,I couldn't forgive any error I made, I was asking too much from myself. Only later I understood that nobody's perfect. There are too many things and they can't work well simultaneously all the time". But now you have proven yourself that you're strong. When did you realize that you returned to the levels of 5 years ago? "At the beginning of the season. I joined the Sanchez Casal academy in June 2006 and worked hard with Marco Panichi for 15 months. I think I am stronger than five years ago, have more experience, I understand the game better and feel like there's less tension on myself". "Now I know that things are ok even if I lose a match. Being aware of this allows me to play more spontaneously, executing my shots more naturally." Definitely. Actually, I've known that since Indian Wells in 2002... but I just couldn't replicate that sort of tennis and that was hurting me. During those hard times, the support from my mother and my brother was very important. Yeah, my family played a vital role." How much does tennis matter to you in a 0 to 100 scale value, and how much do you enjoy life outside tennis? My number one priority, during the tennis season, is tennis 100 percent. I'm always looking forward to the next tournament, try to work on every single detail. It's a price you have to pay but, again, without the help and comprehension from my family, everything would have been harder. During the (short) offseason things are different, I relax, just try to have fun. I know I am very lucky." You live in Monaco.Do you like it? Do you ever return to Slovakia? "It's easier to train in Monaco, the weather is nice, everything is simpler. I stay in Slovakia less than ten days during the year." And what about Rome, and Italy? "Oh, it's my favourite contry, by far! I love everything here. I wouldn't mind settling here, one day. I first came here in Rome, when I was 12 and immediately liked it. I felt in love with the place, the people, the history." A beautiful girl in Rome. Do you find it hard not to get distracted? "It's not hard to conciliate life as an athlete with the pleasures of life, but you have to pay attention. When you're young, and everything happens so quickly, it can be difficult to manage." "Beating Martina Hingis in the IW 2002 final. She was my idol: half slovak, world n.1 for three years." Being able to train with Martina and playing doubles with her was one of her greatest satisfactions. "It felt great to play with her. We once practiced with wooden racquets in Miami, and she was hitting the ball so clean and perfect, almost extraordinary. This is why I've been so happy when she returned on the tour in 2006. Tennis is not only about power, it's rhytm, timing, and she has showed it better than anyone else." We talked about other things (the excessive emphasis about looks in female tennis, the differences in background between her and Maria Sharapova, the example of Anna Kournikova, her favourite tennis players as "role-models", Martina Navratilova and Gisele Bundchen, WTA and other players who care more about their looks...) but I don't find correct talking about these thing before they are published on the mercedes magazine. then and only then, I will put them on this blog. Sure she's the daughter of a math professor (?????) and a doctor who has worked with the Ministry of Health, sister of an architect, and she's aware of the fact that she "only hits a yellow ball". And that in a few years she will earn more than they will probably be able to earn in their whole life. "But I don't think only about money. And again, what we earn seems to be a lot, but you have to be totally committed to tennis and nothing else for a very long time, 20 years or more.. It's not a normal 8 to 16 job, you have to devote yourself, 24 hours a day 7 days a week. People doesn't see this, they only see we're travelling to beautiful places, but you end up being alone in a hotel room for 10 months in a year. Sure hotels are nice, but they aren't home. Sometimes I miss it a lot, but I also understand that it's a privilege to do what you love - and I love to play tennis." I feel I probably should know this, but she's half-Slovak? What's the other half of her ethnic background (just curious)? You're right. On first glance, I took it to mean "half-Slovak like me," but there's really no implication of that.